Definition: Mastocytosis, a type of mast cell disease, that occurs when too many mast cells accumulate in the skin and/or internal organs such as the liver, spleen, bone marrow, and small intestines. It is a rare disorder affecting both children and adults caused by the accumulation of functionally defective mast cells (also called mastocytes) and CD34+ mast cell precursors. Several types of systemic mastocytosis (mas-to-sy-TOE-sis) exist. The most common form — indolent systemic mastocytosis — progresses slowly. Mast cell leukemia and mast cell sarcoma are extremely rare forms of systemic mastocytosis. Treatment is based on the signs and symptoms present in each person. Causes, Signs, and Symptoms of Mastocytosis: Most cases of mastocytosis are caused by a change (known as variation or mutation) in the KIT gene. This gene provides instructions to the body to make a protein that helps control many important cellular processes such as cell growth and division, survival, and movement. This protein is also important for the development of certain types of cells, including mast cells. The KIT mutation makes the mast cells more sensitive to the effects of a signaling protein called stem cell factor (SCF). SCF plays an important role in stimulating the production and survival of certain cells, such as blood cells and mast cells, inside the bone marrow. Mastocytosis can rarely affect more than one family member. In some of these cases, the condition is inherited in an autosomal dominant manner. A person with familial mastocytosis has a 50% chance with each pregnancy of passing along the altered gene to his or her child. 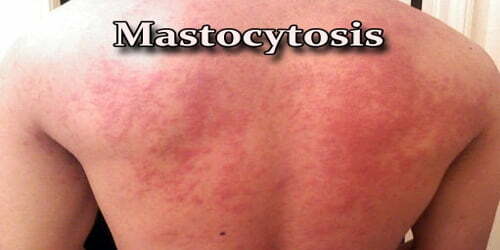 The signs and symptoms of mastocytosis vary based on which parts of the body are affected. Signs and symptoms of mastocytosis are more likely to occur after a “trigger” such as a change in temperature, certain medications, emotional stress, or irritation of the skin. 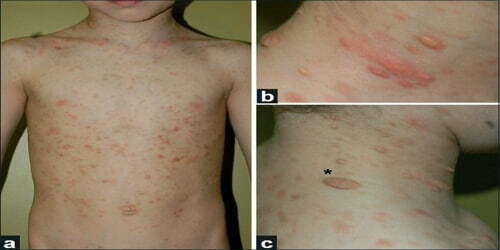 The symptoms of mastocytosis often are similar to the symptoms of an allergic reaction. 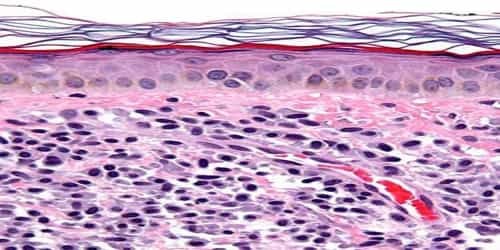 Diagnosis and Treatment of Mastocytosis: Diagnosis of urticaria pigmentosa (cutaneous mastocytosis, see above) can often be done by seeing the characteristic lesions that are dark-brown and fixed. A small skin sample (biopsy) may help confirm the diagnosis. There is currently no cure for mastocytosis, but there are a number of medicines to help treat the symptoms. 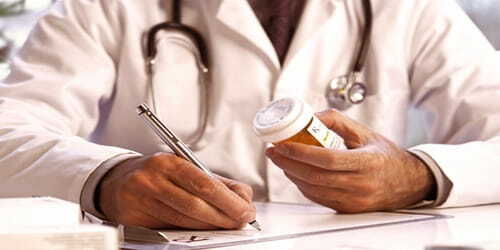 The medication(s) listed below have been approved by the Food and Drug Administration (FDA) as orphan products for the treatment of this condition. Cromolyn sodium (Brand name: Gastrocrom® (oral)) – Manufactured by Azur Pharma FDA-approved indication: Treatment of mastocytosis. Midostaurin (Brand name: Rydapt®) – Manufactured by Novartis Oncology FDA-approved indication: Treatment of adult patients with aggressive systemic mastocytosis (ASM), systemic mastocytosis with an associated hematological neoplasm (SM-AHN), or mast cell leukemia (MCL). Treatment for symptoms that affect the skin include antihistamines and oral psoralen plus UVA (PUVA) therapy. If the symptoms are not responsive to other treatment, a doctor may prescribe steroid creams, ointments, or solutions to be applied to the skin (topical corticosteroids treatment). Proton pump inhibitors can be used to treat gastrointestinal symptoms and bone pain. Allogeneic stem cell transplantation has been used in rare cases with aggressive systemic mastocytosis in patients deemed to be fit for the procedure.